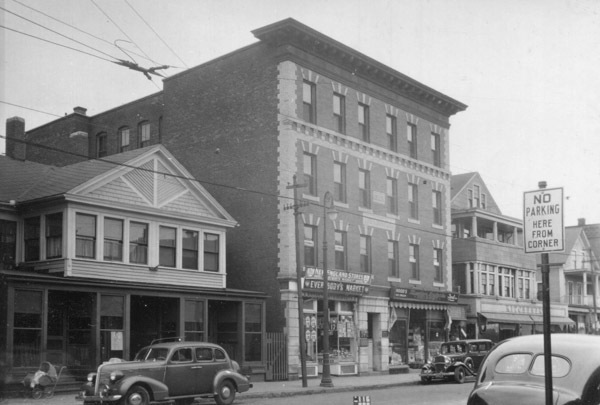 The building at 162-164 Main Street in the Indian Orchard neighborhood of Springfield, around 1938-1939. Image courtesy of the Springfield Preservation Trust. 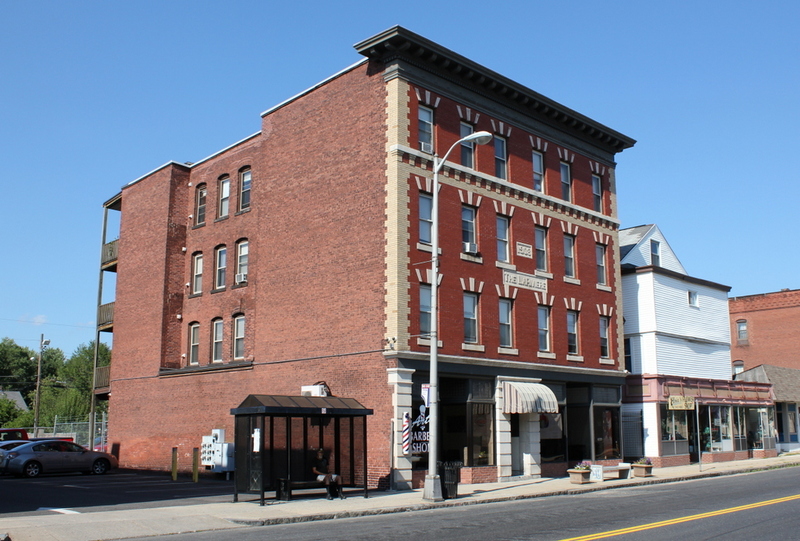 This commercial block was one of several Indian Orchard properties that were owned by Octave A. LaRiviere, a French-Canadian merchant, politician, and contractor who was among the neighborhood’s leading citizens of the late 19th century. LaRiviere, who also went by the name of John Rivers earlier in his career, lived in the house directly to the right of this building, and he also owned a tenement building, which was located a block west of here on Main Street. This four-story brick building was completed in 1908, and was known as The LaRiviere. It is perhaps the most architecturally significant of the several late 19th and early 20th century commercial buildings here on Main Street, and it features an ornate, polychromatic Classical Revival facade. There are two storefronts on the ground floor, with apartments in the upper floors, and the 1910 census shows at least four families in the building. Based on the census records, the residents were primarily skilled laborers and other middle-class workers at the nearby factories in Indian Orchard, and included a machinist, a foreman, an inspector, a pattern maker, a traveling salesman, a clerk, and a chief engineer. By the time the first photo was taken, America was in the midst of the Great Depression, but there were still a good number of factory jobs here in Indian Orchard. As was the case in 1910, most of the residents worked as skilled laborers, with the 1940 census showing that most of them earned around $1,000 to $1,300 per year. The building had five different families at the time, with two each paying $40 per month in rent, one paying $36, one paying $20, and one whose rent was not included on the census. Today, The LaRiviere is one of several historic commercial blocks in the center of Indian Orchard. It remains remarkably well-preserved, with even the storefronts looking the same as they did over 80 years ago. LaRiviere’s house, located on the right side of the scene, has since been altered, but it is still standing and still recognizable from the first photo. The only significant change in this scene is the building on the left, at 158-160 Main Street. It was still standing here as late as the 1980s, when it was included in the state’s MACRIS database of historic properties, but it has since been demolished, and the site is now a parking lot.